To facilitate the Committee’s evaluation of Mexico’s combined V and VI Periodic Reports (E/C.12/MEX/5-6) – which were due in 2012 but submitted in 2016 – as well as Mexico’s replies (E/C.12/MEX/Q/5-6/Add.1) to the List of Issues (E/C.12/MEX/Q/5-6), our report contains 20 chapters that follow the order of the articles of the International Covenant on Economic, Social, and Cultural Rights (“Covenant”) and the topics of particular interest that the Committee included in the List of Issues (access to justice, human rights defenders, business and human rights). In each chapter, we highlight ESC rights concerns citing data, analysis, and case studies. We point out important information included in or omitted from the official periodic reports and propose recommendations for the Committee’s final observations on Mexico. In this executive summary, we present some of the key messages and concerns contained in each chapter. Our report also includes a compilation of all of our suggested recommendations in Spanish and English. In addition, we submit other reports and documents as annexes, in order to provide in-depth information on several topics. The present report includes input from civil society organizations and networks from different Mexican states, who collaborated over a period of almost 3 years, including in the submission of information to the pre-sessional working group at the beginning of this year. This input reflects an important part of the ESC rights panorama in the country. As for the State’s combined reports, produced through a largely internal government process, it is important to note that the participation of some of the undersigned organizations in meetings convened by the Ministry of Foreign Relations in November 2014 and July 2017 does not amount to a consultative or participative process for the preparation of the official reports. On both occasions, we presented criticisms of official data and analyses, which were not fully considered by the State. 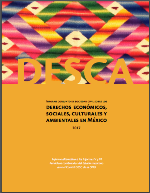 Download here the Joint alternative report on the situation of economic, social, cultural, and environmental rights in Mexico (complete version in Spanish, executive summary in English and the executive summary in Spanish. Source: Habitat International Coalition América Latina.